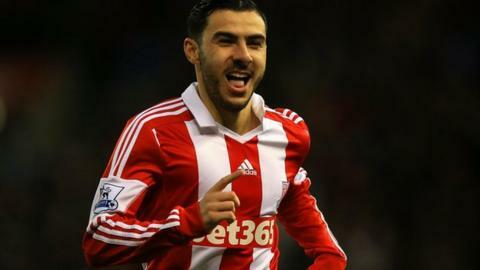 Liverpool's asking price for winger Oussama Assaidi is still above Stoke's valuation of the player, says Potters chief executive Tony Scholes. The Reds are understood to have asked £7m for the 25-year-old, who scored four goals in 24 appearances after spending last season on loan at Stoke. "Everything points to it being a good match for both the club and the player," Scholes told BBC Radio Stoke. "But, at the moment, the prices we are being quoted are just wrong." The Morocco international joined Liverpool from Dutch side Heerenveen in 2012 but made just four substitute appearances in the Premier League for the Reds before moving to Stoke last August. "As the chairman and the manager have already said, he's a player we like," added Scholes. "He did very well last year and settled in." Stoke have so far signed four players this summer: Sunderland defender Phil Bardsley, Fulham midfielder Steve Sidwell, Hannover striker Mame Biram Diouf and another defender, Dionatan Teixeira, from Slovakian side Banska Bystrica. The Potters are also confident of retaining the services of Steven N'Zonzi next season - despite reports saying that the 25-year-old French midfielder, whom they signed from Blackburn Rovers two years ago - is unsettled. "Steven's a very good player," said Scholes. "Particularly in the last few months of last season, he did exceptionally well. He's not a player we want to lose. We hope there's a positive outcome."